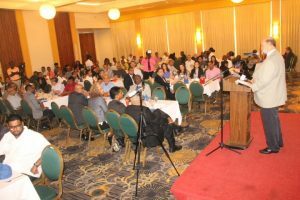 United States Ambassador, Perry Holloway addressing a luncheon organised by the Guyana Manufacturing and Services Association at the Pegasus Hotel on July 10, 2018. United States (US) Ambassador to Guyana, Perry Holloway on Tuesday said there has been a “slight” decline in crime in Guyana over the past three years, but political will and money are needed to fight the scourge especially at a time of soaring cocaine production in Colombia. “It’s fine for the Americans to come in and offer some help. 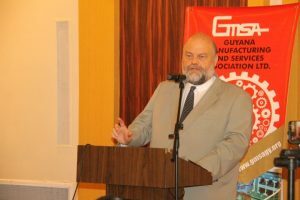 It’s fine for the Brits to come in and have a security programme, but if the government and the people and the private sector and civil society do not want it, all programmes are gonna fail,” he told the luncheon organised by the Guyana Manufacturing and Services Association (GMSA). Holloway explained that political will was not only confined to the politicians but all those who have a stake in curbing criminal activity. “Everyone has got to decide this is something we want to deal with and we are willing to put our money towards it, our energy towards it and we are going to build our institutions,” said Holloway, who remarked that the US would not have been successful in Colombia if the national stakeholders had not committed meaningfully to tackle crime. 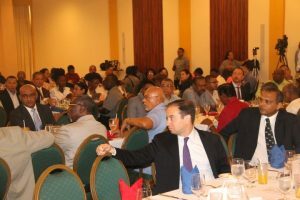 Opposition Leader and former President, Bharrat Jagdeo; former President Donald Ramotar and Dr. Frank Anthony among the attendees at the GMSA Luncheon. The event was attended by, among others, Opposition Leader, Bharrat Jagdeo and two of the known presidential candidate hopefuls for the People’s Progressive Party- Dr. Frank Anthony and Irfan Ali. No government minister attended the event, most likely because of the statutory Cabinet meeting. The lone uniformed Guyanese security agent who stood out among the gathering was Assistant Commissioner of Police, Leslie James. As the South American nation prepares to pump up oil commercially in March 2020, the American envoy said more money would be available and criminals will certainly try to cash in. 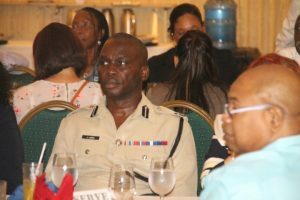 While Guyana has been attracting far less American government funding to fight crime compared to countries in Central America, he called on Guyana to spend more on modernising crime fighting. “If you want to stop crime from ramping up, then probably more money would need to be spent, whether we like that or not…You can’t have police or GDF (Guyana Defence Force) or other officials going after twenty-first century criminals with nineteenth century equipment and institutions. It just can’t be done,” he said. The American Ambassador at the same time credited the then People’s Progressive Party Civic administration and the current A Partnership for National Unity+Alliance For Change-led administration with spending “a lot of money on security”. Noting that the US has spent about US$80 million in the last 10 years on security in Guyana, resulting in some “results” – marginal movement. Assistant Commissioner of Police, Leslie James. “These guys are not scared of us. They are not scared of the police so you are going to do wonderful actions to stop them and you are going to succeed, but then they are going to do counteractions so you have to be prepared that there is no silver bullet…It will not happen,” said Holloway who worked in hot-spots such as Afghanistan and Colombia. Holloway said the Caribbean should be worried about “soaring through the roof” production of coca, the main raw material for making cocaine, in Colombia. He explained that would certainly result in traffickers using all of the transshipment routes including Venezuela, Panama and Guyana to get the narcotics out. Analysis, he said, has shown that more cocaine was being circulated in transshipment countries because traffickers preferred to pay local traffickers in quantities of the drug instead of hard cash and at the same stimulate increased domestic demand by addicts and associated crimes. “Once demand increases, there are certain drugs-cocaine especially, heroin is another one- that once you get into the cycle and get further into the addiction, then you will do anything to get more of the drug and once your money runs out, what is your only option- then it is to steal or sell your body or some other horrible thing,” he said. The Ministries of Public Health and Education, he said need to play major roles in discouraging persons from engaging in criminal activities and rehabilitating drug addicts. Noting that more than half of Guyana’s 746,955 persons are younger than 26 years, Holloway said older politicians in government and opposition are seeing youths demanding instant gratification. In that regard, the American diplomat called for more attention to be paid to youths or they could slip into criminal activities to satisfy their immediate wants. “Somehow, you have go to figure out a way to keep the young people employed, keep them happy, keep them focused because, if not, if there is despair they will fall into things that are not helpful for them or they want money now to buy the fancy car or the latest IPhone so they will get involved in things they probably should not get involved in so that later on they will pay a price,” he said. He remarked that Guyana could use its “tremendous revenue stream” from oil production to create jobs in the areas of light manufacturing, agriculture and infrastructural development while at the same time diversifying the economy ahead of the exhaustion of oil. United States Ambassador, Perry Holloway addressing the GMSA luncheon. The US, he remarked, is the perception of victim-less crimes such as gold smuggling that robs the country of much needed revenue. He also pointed out that trafficking in persons, such as a few Venezuelans and Haitians, is expected to increase as the country becomes wealthier. “As your economic base increases, there is more money here. There is more people. You will likely see more people being trafficked,” he added. Recently, concerns were raised at the bipartisan parliamentary committee on foreign relations about the apparent trafficking of tens of thousands of Haitians and Cubans. Minister of Citizenship and Immigration, Winston Felix has already said most of the Haitians are leaving illegally across the Corentyne River to neighbouring Suriname and the Cubans are crossing the Takatu in southern Guyana to Brazil. It is believed that most of the Haitians eventually end up in French Guiana which shares historical and cultural ties with Haiti and France.